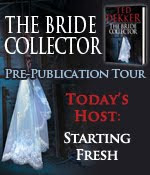 Welcome to the Book Blog Tour of Ted Dekker's The Bride Collector which comes out on April 13, 2010. Ted Dekker's The Bride Collector introduces us to Special Agent Brad Raines who is tracking a highly intelligent, mentally unstable, and seemingly untraceable serial killer. But beyond the fast-paced action, the violence, and plot twists of a good detective thriller, Ted Dekker adds an element of humor and humanizes schizophrenia and mental illness through the characters of the Center of Wellness and Intelligence and through the personal history of our lead character, Brad Raines. Although Special Agent Brad Raines is attractive, intelligent, and strong like many of the usual lead characters in detective thrillers, Raines doesn't come across like the usual witty and invincible lead. Raines suffered a heavy loss in his personal life and hasn't been able to fully recover. His loss makes Raines better able to empathize and understand the insecurities and thought processes of the people around him from the patients at the Center to the serial killer they're calling the Bride Collector. It also makes Raines more interesting than your usual lead detective. If you're looking for a fast-paced and unconventional detective thriller, check out The Bride Collector. Publisher: Center Street (April 13, 2010), 448 pages. Thank you to Miriam and Hatchette Book Group for this review opportunity! Great review! I loved this book too, and found it to be very different from your normal "serial killer" stories!